I bought a 300 GB NAS box about 10 years ago, and although it still works fine it had finally filled up. The thought that it has all my digital life on one spinning disk was also making me feel uneasy – especially given that it has been spinning for a decade. So, I was looking for something bigger to replace it but I knew that I wanted something with some redundancy against physical hard drive failures. Now, these types of redundant NAS boxes don’t come cheap and they only do one job, so I was finding the costs hard to justify. Perfect timing then that I came across a great deal from HP on their Proliant Microserver. They were offering £100 cash back, which meant that I could by the server for a little over £100. I also bought two 2 TB hard drives at the same time, so the total cost was about £250. This compared very well to the NAS boxes I had been looking at that were nearer the £500 mark. Of course there was the added bonus that I would get to install the operating system, and configure everything myself. Some people will see that as a hassle, but I love it when I know how all my computer bits work on the inside! Naturally, I opted for an open source solution and decided to install Ubuntu Server 12.04 LTS. The HP Proliant literature claimed it had RAID built in, but I soon realised that this is handled in software by the BIOS and takes some processor cycles. A few quick tests convinced me that I wouldn’t use the built in RAID and instead opted for Ubuntu’s software RAID instead. This was more configurable, and seemed to perform faster than the built in solution! Having never built a RAID array before, I opted for RAID 1 which means that each of the 2 TB drives is a perfect copy of the other. This means that if one drive fails, my data is safe on the other. The install was very easy (hooray for Ubuntu!) and with the addition of some Samba packages, it didn’t take long before I had a working NAS. It performs very well, and is much faster than the old NAS box it replaces. Future plans include adding a streaming webcam server, and an AllStar link node for amateur radio. 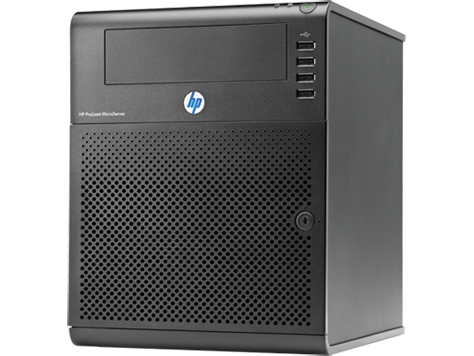 If you’re looking for a small home server, then I’d recommend the HP Proliant range. Especially if you can get it with a cash back offer like I did.